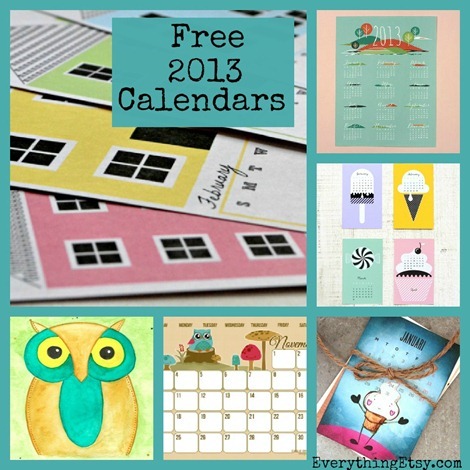 Printable calendars that are totally free?? Get out of town! There’s such a wonderful selection of free printable calendars for 2013 available right now for you to print out at home in minutes. That’s the coolest thing! I usually end up with more than one calendar every year. Since these are free you should treat yourself to one for every room! Cute & Colorful 2013 Calendar – Hello, Cuteness! How cool is that??? Can you believe how easy it is to print pretty calendars like these for free?? Share this list with your friends and they’ll love you for it! I wish you all a fabulous new year full of love, health and happiness! Do you have a favorite type of calendar? Do you need more than one? I personally like the write-in ones! Yippee skippee!!! Fabulous!!! Thanks a gazillion! SUPER FUN!!! Sharing sharing sharing. Luv luv luv! The “Hello Cuteness” one is perfect for my own kids’ walls! Thanks. Thank you for adding my calendar! Thank you so much for uploading this!! I adore the Vintage Printable cAlendar!! I scrolled and clicked on EVERY ONE of these calendars looking for one that had lines for writing within the days. I am terribly OCD and printed one in October that did not have any lines for writing and now it is driving me crazy and I must find one with lines. If any of you have suggestions, I am grateful FOR-EVER. thanks. Oh and not to sound un-grateful, these were super awesome! I loved at least 10 and cried out loud that they did not have lines so my nutty-self could be happy. Thanks to everyone that shared and I will work on my neediness of the lines. How cute of you to gather all these links… I’ll make a link from you for French blogs ! I don’t usually post links in comments but I thought I’d let you know about this one too.